It makes sense that we got a bumper crop of electrified crossovers at the 2019 Detroit Auto Show. But is there some rule saying they all have to look like they’re crouching and squinting? 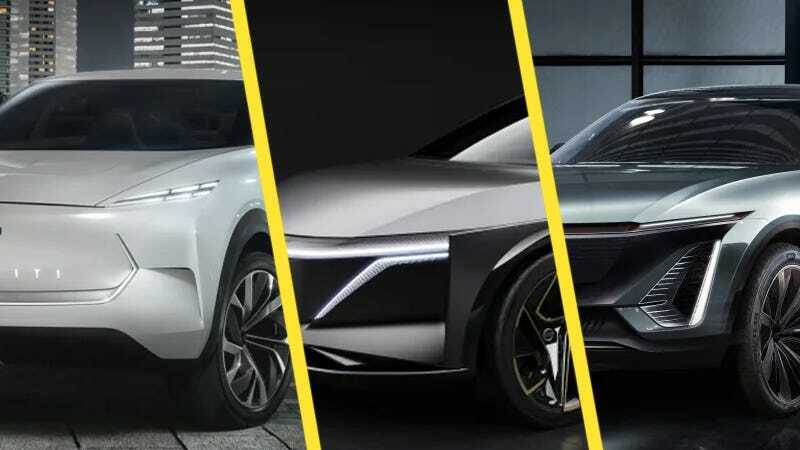 The new Infiniti, Nissan and Cadillac EV crossovers don’t look identical per se but I mean, it seems pretty clear that impossibly sharp angles, scrunched faces and really, really thin headlights are the Look Of The Future, Today! So are we moving toward an automotive singularity where every car looks like an even angrier Lamborghini Urus? No. I mean... maybe. I was about to say that we’ll always have the friendly-faced Miata to bring us comfort under the crushing oppression of digitized future, but even everybody’s favorite practical roadster gets a little sharper every time it’s redesigned. Maybe that happy Honda concept will be the saving grace for circles in automotive design.